statii.com: For all things Status-Graphite - Discussion Forum: Status S2 Classic 5-string Headless trough neck. Status S2 Classic 5-string Headless trough neck. For sale a new Status S2 Classic 5-string Headless Trough Neck. * Front & Side leds - Red. * Burl Maple top with Maple Faux Binding. * Custom Two-piece mahogany body with a Walnut tone block and graphic trough neck under face. 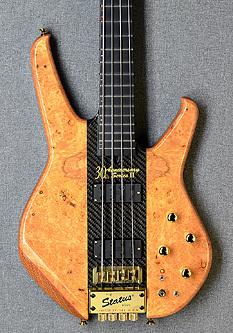 * Phenolic fingerboard with 24 frets. * 2 Soap-bar pickups with a 303 Board electronics. * High Gloss Polyester Finish. * Status hardcase, paperwork and candy included. * Never giged. 100% mint condition.